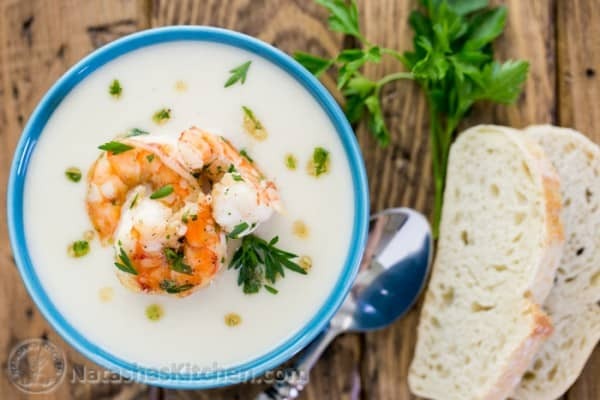 This Creamy Cauliflower and Potato Soup with Shrimp is amazing! I’ve made it twice and can’t wait to make it again. It brought me back to Mexico and all the gourmet soups we tried on our honeymoon. 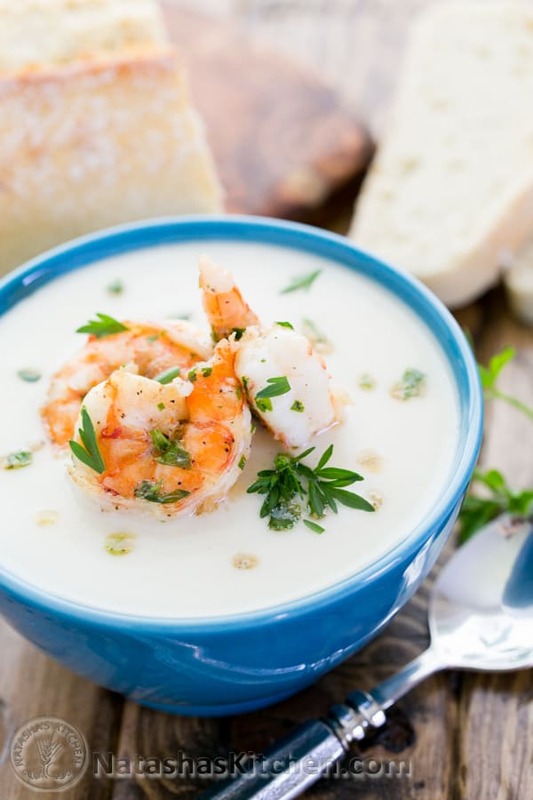 This creamy soup definitely has the WOW factor; and your dinner guests will agree. 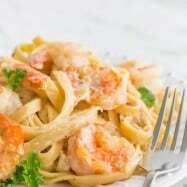 Can you imagine juicy shrimp and creamy deliciousness taking over your palate? Did I mention this recipe comes from the same Cousin Lena who created the (wildly popular) chebureki? 1. Add 1/2 cup of olive oil to a medium soup pot and turn the heat to medium. Add diced onions ands saute them for a minute. 2. 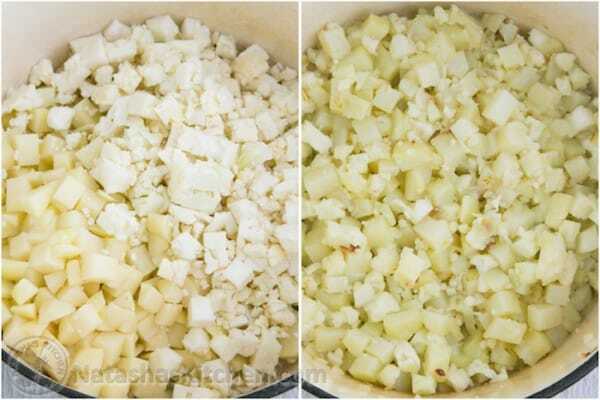 Next, add chopped cauliflower and potatoes to the pot with onions and cook until onions become transparent. 3. Pour in four cups of water along with 2 tsp of salt, 1/2 tsp of pepper and 1/4 tsp of cayenne pepper. Than bring everything to a boil. 4. When water boils, add one cup of Heavy Whipping cream. 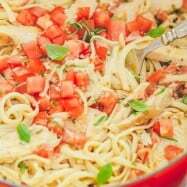 Cover and let it cook until potatoes are cooked through (15- min). In the mean time prepare shrimp. 5. Preheat the skillet over medium/high heat. 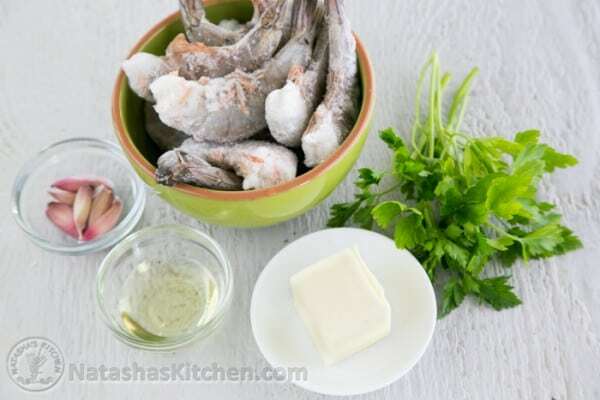 Add 1 Tbsp oil, butter, peeled shrimp and garlic. Sprinkle with salt, pepper and parsley. Saute until cooked through, about 3-4 min. 6. 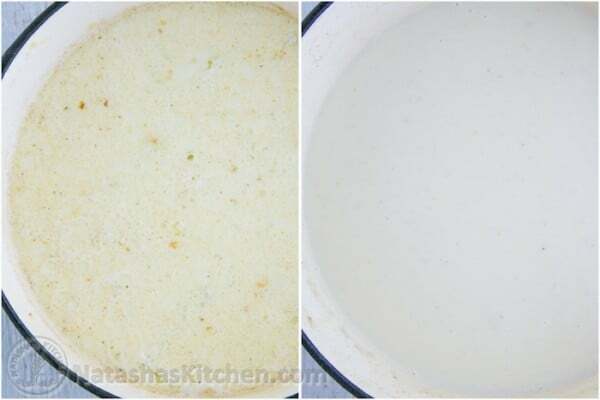 After soup has finished cooking, remove the pot from heat and using immersion hand blender puree until smooth consistency. 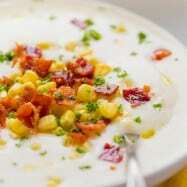 Or just use whatever blender you have on hand to puree soup until smooth. I like the first method better because everything is done without removing soup from the pot. Napoleon isn’t the only star of the show. Oh my gosh, I couldn’t stop laughing reading napoleon quotes. Ok, goodnight. 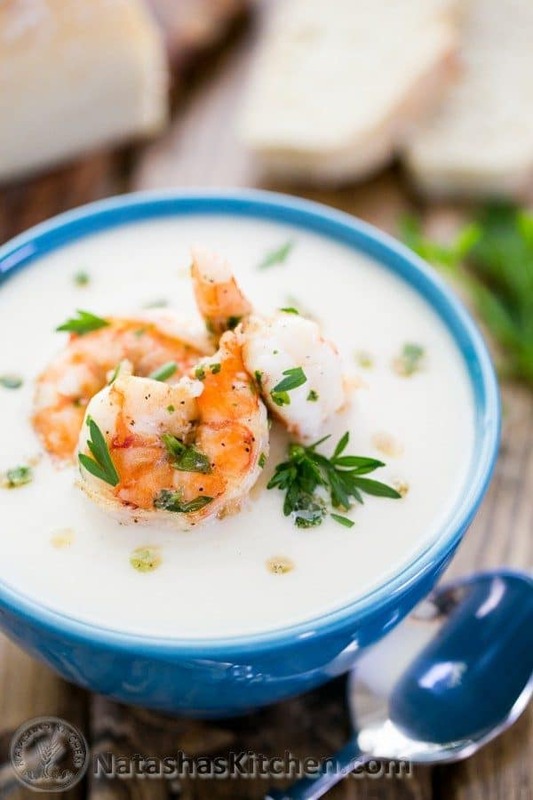 Pleasant dreams of creamy cauliflower and potato soup topped with succulent shrimp. Add 1/2 cup of olive oil to a medium soup pot and turn the heat to medium. Add diced onions ands saute them for a minute. 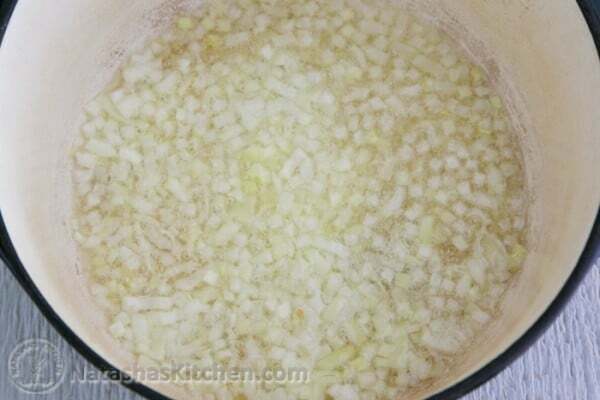 Next, add chopped cauliflower and potatoes to the pot with onions and cook until onions become transparent. 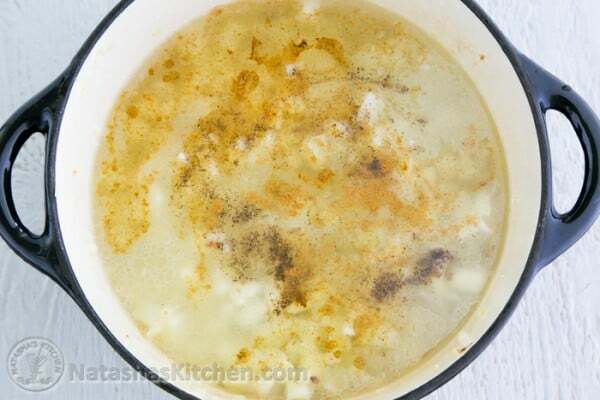 Pour in four cups of water along with 2 tsp of salt, 1/2 tsp of pepper and 1/4 tsp of cayenne pepper. Than bring everything to a boil. When water boils, add one cup of Heavy Whipping cream. 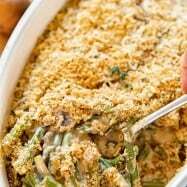 Cover and let it cook until potatoes are cooked through (15- min). In the mean time prepare shrimp. Preheat the skillet over medium/high heat. 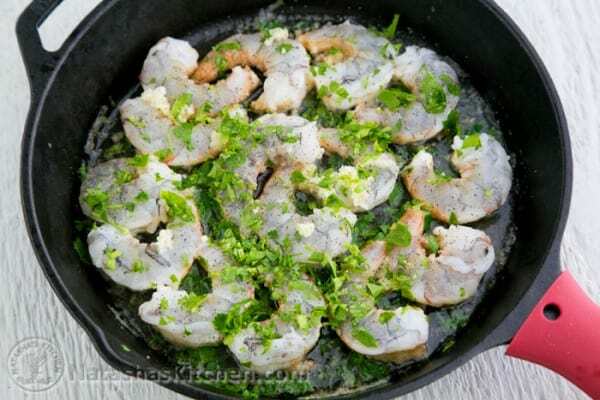 Add 1 Tbsp oil, butter, peeled shrimp and garlic. Sprinkle with salt, pepper and parsley. Saute until cooked through, about 3-4 min. 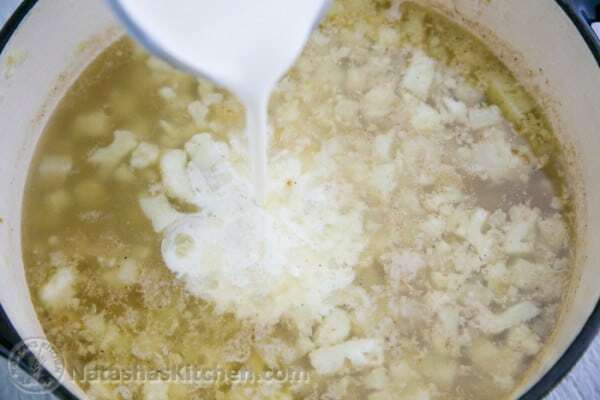 After soup has finished cooking, remove the pot from heat and using immersion hand blender puree until smooth consistency. 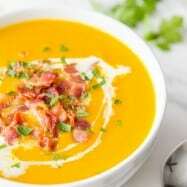 Or just use whatever blender you have on hand to puree soup until smooth. I like the first method better because everything is done without removing soup from the pot. 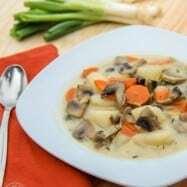 This soup is unique, delicious and beautiful! My husband thought it was a little thick but to my taste – perfect! Love this new way of enjoying shrimp! Mm-mmm! Also, don’t have a blender other than bullet (small) so blended only a cup to see if it tastes different in chunks- it does! As a purée its a mysterious blend of flavors but as chunks, well you taste everything separately a bit so I say blending it as a must! i just made it!!!! its soooo delicious!!! i added a bit of bacon to the soup and didn’t blend all of it! 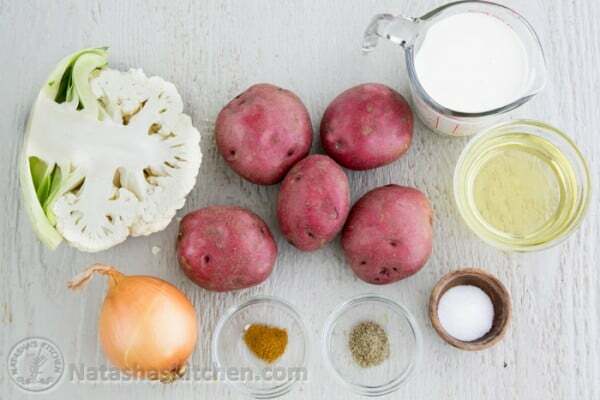 left small pieces of cauliflower and potatoes! but it was amazingly good!!! my whole family loved it! thanks so much!!! God Bless you!